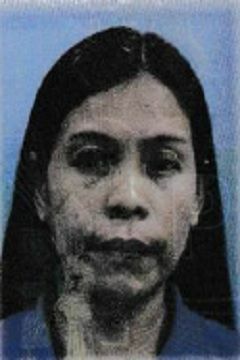 NESIL BAYOS MONTECILLO, a 36-year-old single mother of 2 children ages 13 and 11 year old from General Trias, Cavite. She is the 4th child among her 7 brothers and 3 sisters. Both her parents already passed away. She accomplished her secondary education at Dr Gerardo Sabal Memorial National High School year 2001. Previously, she worked as a saleslady for 4 years and janitress for 1 year. She had her maid employment experience in the Philippines from Aug 2012 - June 2016 for a British-indian family / Aug 2016 - Dec 2016 served a British - New Zealander family / Apr 2017 - Oct 2017 served an Irish family. Currently, she is working as a housemaid for a British family while waiting to be selected for Singapore. 1) Philippines (Aug 2012 - June 2016) she served a British-Indian family living in a 4-bedroom 2 storey house with a couple and 2 children ages 13 and 17 year old. She worked as an all around housemaid doing all general housework such as maintaining the cleanliness of the house, washing and pressing clothes, marketing, cooking, washing dishes and she also taking care of the daily needs of the children. She served the family for 3 years and 10 months. 2) Philippines (Aug 2016 - Dec 2016) she served a British- New Zealand family living in a 3-bedroom 2 storey house with a couple and 2 children ages 2 and 6 month old baby. She worked as an all around housemaid doing all general housework such as maintaining the cleanliness of the house, washing and pressing clothes, marketing, cooking, washing dishes and she also taking care of the daily needs of the children. She served the family for 4 months. 3) Philippines (Apr 2017 - Oct 2017) she served a Irish family living in a 4-bedroom 2 storey house with a couple and 4 children ages 5,3, and 6 month old baby (twins). She worked as an all around housemaid doing all general housework such as maintaining the cleanliness of the house, washing and pressing clothes, marketing, cooking, washing dishes and she also taking care of the daily needs of the children. She served the family for 6 months. 4) Philippines (Nov 2017 - Present) serving a British family living in a 4-bedroom 2 storey house with a couple and 2 children ages 8 and 6. She worked as an all around housemaid doing all general housework such as maintaining the cleanliness of the house, washing and pressing clothes, marketing, cooking, washing dishes, gardening, care for dog and also taking care of the daily needs of the children. With her 6 years of experienced as a housemaid in the Philippines. She is expected to be well versed in doing household chores such as cleaning, doing the laundry, pressing clothes, washing the dishes and marketing. As a mother of 2, she is confident in performing basic infant care duties like bathing, sterilizing utensils, preparing baby's food, feeding, changing of diaper, knows how to check body temperature and giving proper medication if the child feels unwell. She is also capable in taking care of young children and attending for their needs. She is also keen to look after elderly person if given a chance. She has knowledge in cooking Filipino dishes such as adobo, afritada, caldereta, pakbet, chopsuey and a lot more. She can also cook simple Western dishes like chicken stew, lasagna, beef stir fry, sweet and sour fish and a lot more and she is eager to learn other foreign dishes.